Famous Kin of Oliver Wendell Holmes, Jr.
Who was Oliver Wendell Holmes Jr.? Oliver Wendell Holmes, Jr. was an Associate Justice of the United States Supreme Court. He is said to be one of the most widely cited U.S. Supreme Court justices and The Journal of Legal Studies claims he is the third most cited American legal scholar of the 20th century. He retired from the court at the age of 90 as the oldest member of the court in its history. Oliver Wendell Holmes, Jr. was the son of American poet Oliver Wendell Holmes, Sr. He was a veteran of the Civil War having been wounded in three separate battles. During his career, Holmes also served as an Associate Justice and as the Chief Justice of the Massachusetts Supreme Judicial Court. Oliver Wendell Holmes, Jr. was an alumni of Harvard Law School and later held the professorial position of Weld Professor of Law at the school. 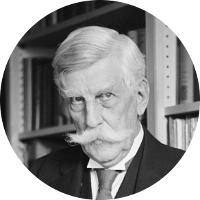 Oliver Wendell Holmes, Jr. has a very extensive New England ancestry which gives him a very large number of famous kin. His father, Oliver Wendell Holmes, Sr. was a well known American poet. Other well known poets in his family tree include Geoffrey Chaucer, author of The Canterbury Tales, Robert Frost, Henry Wadsworth Longfellow, and Ralph Waldo Emerson. The latter two were also friends of his father. He also has family ties to the infamous Salem Witch Trials. This includes John Proctor, executed as a witch in 1692, and William Stoughton, chief judge and prosecutor at the trials. Oliver Wendell Holmes, Jr.’s ancestry can be traced backed as far as King Edward I and at least five Magna Carta Surities. Other royal connections include the late Princess Diana, Princess of Wales, Leka I, King of Albania, and Ferdinand II, King of Spain. Presidential kin include George Washington, Thomas Jefferson, James Madison, Ulysses S. Grant, Theodore Roosevelt, William Henry Harrison, Chester Arthur, William H. Taft, Benjamin Harrison, Herbert Hoover, Franklin D. Roosevelt, Calvin Coolidge, and both Presidents Bush. View Famous Kin of Oliver Wendell Holmes, Jr.